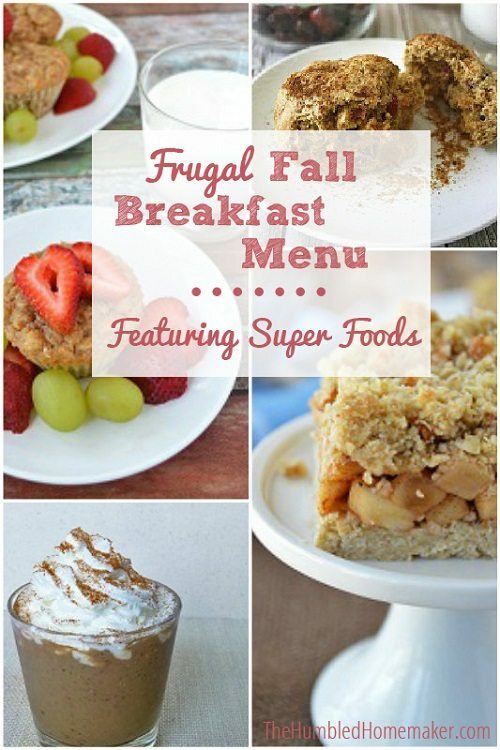 Get nourishing, frugal fall breakfast menu ideas in this post! These seasonal recipes include fall super foods to keep you healthy and boost your immune system. With cold and flu season approaching, moms everywhere are stocking their natural remedy kits with essentials from the kitchen, like honey for coughs and apple cider vinegar for sore throats. What we often forget though, is that while certain foods have the ability to heal our bodies, they can be a preventative medicine too! Although not technically a medical term, foodies have coined the phrase “super foods” for those foods with an unusually high concentration of nutrients. Apples, pears, pumpkin (all squash really), cranberries and dark leafy greens are all superfoods that are jam-packed with good-for-you nutrients. And lucky for us, they’re in season in the fall! Incorporating fall super foods into your daily meals makes it easier to keep your body healthy (since 80% of your immune system is in your digestive system). As a bonus, eating seasonally is one of the best ways to eat real food on a budget. 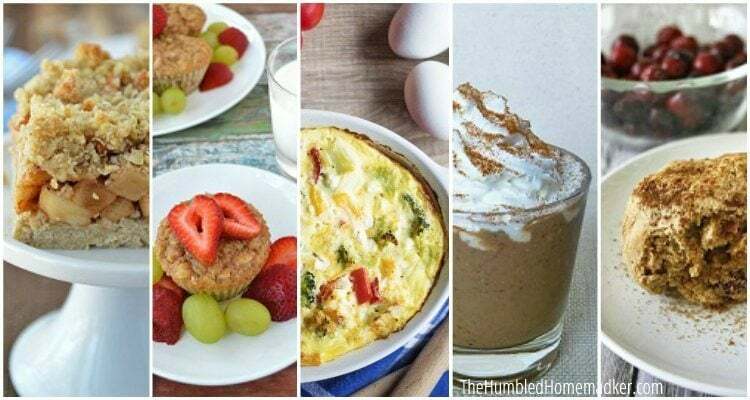 Since it’s easy to let the day slip by without a daily dose of super foods, I’ve created a frugal breakfast meal plan that is centered around the nutritious super foods available this time of year. I figure, what better way to get in your vitamins than first thing in the morning! Let me warn you: This breakfast menu is not your typical meal plan like the ones I normally share each month. No recipes are assigned to specific days and no recipe is even written in stone. Instead, this breakfast meal plan is written in order to best benefit YOU. Tailor each meal based on what you already have in the kitchen and the fresh produce available in your area. Do you have apples from a local u-pick farm? Then use those! Apples aren’t on sale but you scored a great deal on marked down pears? Use those instead! You can swap flavors (like any winter squash for pumpkin, or any dark leafy green for another), double a recipe, or even freeze meals for later! The best meal plan is one that works for you, so substitute, swap and adjust however you see fit! 1. Focus on one or two super foods at a time. While it’s tempting to grab every super food on the shelf in order to boost our immune systems, doing this will almost certainly cause you to go over-budget at the store. Instead, focus on just one or two super foods each week and build your breakfast menu around those. 2. 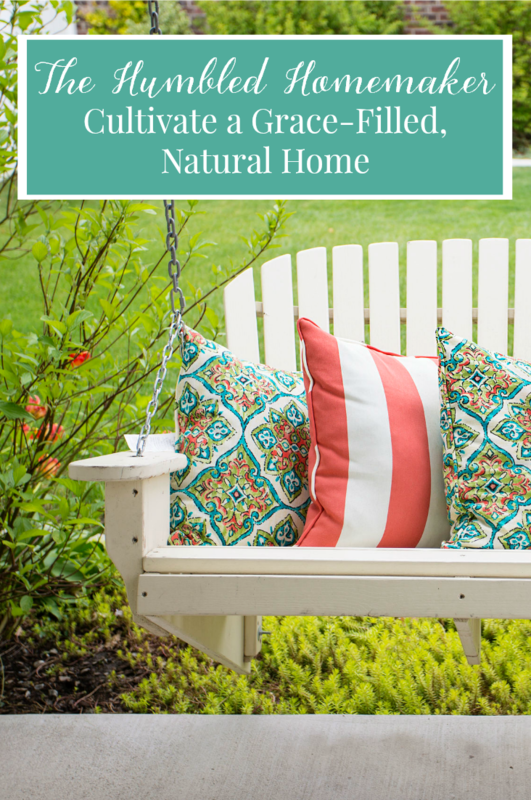 Shop the weekly circulars and local farmers markets. Aim to pay $1 per pound for non-organic produce (cranberries, squash and pumpkin) and $2 per pound for organic (apples, pears and dark leafy greens). If organic produce is not in the budget, don’t worry about it. Any produce is better than none! 3. 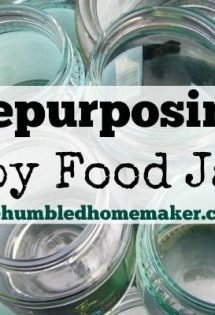 Look for marked down produce, seconds or “jam” fruits. These are the foods that aren’t aesthetically perfect, but they’re still full of the same nutrients! Often found for 50% off or more, clearance produce an excellent way to stretch your grocery dollars. Tip: Get started with your own frugal grocery budget using clearance produce. A favorite of my kids, oatmeal apple bars are frugal, easy and incredibly delicious. Honestly, it’s like having pie for breakfast! You can easily adapt this recipe for gluten-free and dairy-free diets, and you can substitute pears for apples (choose whichever is on sale that week!). Tip: One batch makes nine servings, but double the recipe for 18 servings and breakfast for three kids is ready for an entire week! Quite possibly the most affordable and versatile breakfast in your kitchen is baked oatmeal (pictured above). Traditionally, you mix up baked oatmeal the night before and bake it in the morning. However, you can maximize your time in the kitchen by using leftover plain oatmeal and this conversion recipe to make any flavor of baked oatmeal you want. Use apples, pears, cranberries or pumpkin – whatever you have in the kitchen – to easily make a breakfast supercharged with super foods. Tip: Double or triple the recipe and bake individual portions in silicone baking cups and freeze. Then simply pull one or two out and reheat for a super fast and portable breakfast! You might also enjoy these recipes for Make-Ahead Apple Cinnamon Baked Oatmeal and Slow Cooker Pumpkin Spice Baked Oatmeal. Frittatas (no-crust) and quiches (with crust) are excellent ways to incorporate dark leafy greens into the breakfast menu. This recipe is my personal favorite since it uses both broccoli (another super food) and any dark leafy green that you have on hand. Chard, kale, spinach, beet greens, turnip greens…you name it and the green can be used. Similar to traditional baked oatmeal, this too can be mixed up the night before and baked in the morning. If you double the recipe, once again you’ll have breakfast for a whole week! 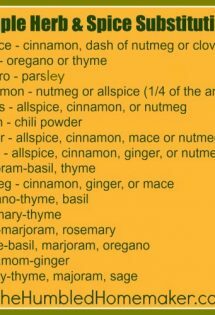 Tip: You can substitute any pie crust for the crust in this recipe, or simply omit it altogether. Also consider swapping a 9″x9″ square pan for the pie pan to make it easier to cut into servings. My personal favorite, these scones are uh-ma-zing. They’re delicious enough for a ladies fellowship, but simple enough for family breakfast. Whether you make them with butter or cream, these cranberry orange scones are hands down the best way to highlight the tart, bright flavor of fresh cranberries. Tip: Buy an extra bag of fresh cranberries when they’re in season this fall, aiming for $1/lb. Freeze them in a gallon ziploc bag and you’ll have fresh cranberries year round! This dish is my go-to dish for pot-luck meals, but the pear/apple crumble is also one of my favorites for breakfast thanks to the high ratio of fruit to crust. Any combination of apples, pears and cranberries can be used as well as any sweetener, or no sweetener at all if you prefer! Tip: This dish is an excellent way to use up fruit when you don’t have enough to make an entire recipe of something else. Simply chop up what you have, mix it up and sweeten to taste. Consider baking it in a smaller dish too if you don’t have enough for a full pan. Finally, don’t leave out the incredibly simple smoothie! One handful of spinach can be added to ANY smoothie without affecting its flavor, making it the best way to get a daily dose of dark leafy greens. My favorite pumpkin pie smoothie is in my book, but you can get my apple pie smoothie recipe here and enjoy TWO doses of super foods in one glass! You can also get 25 delicious smoothie recipes here. Tip: Spend a few minutes at the beginning of the week chopping up fruits and vegetables for smoothies. Package them into quart-sized bags and store them in the freezer. Then for breakfast, pull out a bag and add it to the blender along with your liquids. This will tremendously cut down on the time spent in the kitchen! What are your favorite fall breakfast recipes and fall superfoods? 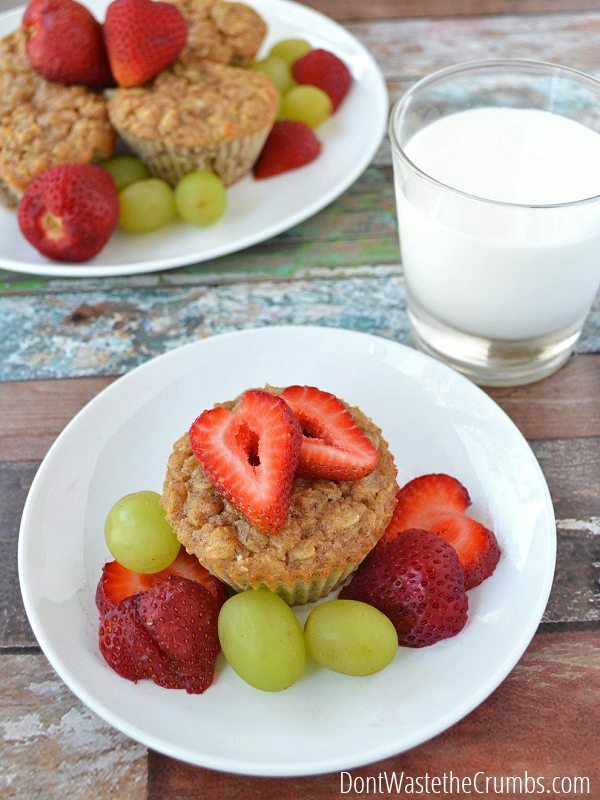 These sound delicious…now to get my picky eaters to cooperate! I adore cranberries! That scone recipe looks like a keeper. It’s nice to know they’re a superfood. When they’re on sale, I usually buy as many bags as my budget will allow and throw them in the freezer. We can enjoy cranberry dishes for many months this way. Thanks so much for this great collections of recipes & for tips on how to keep healthy food frugal. I’m pinning this one for sure. 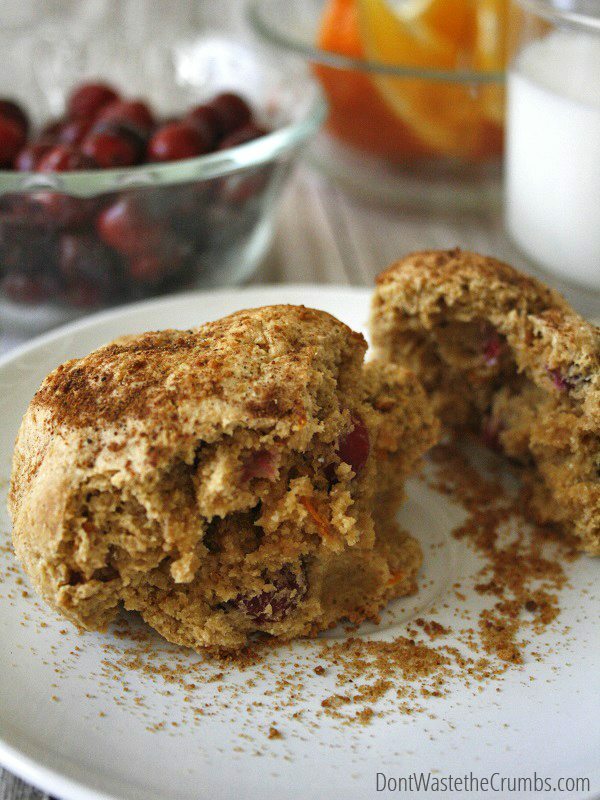 One of my favorites Pumpkin Cranberry Muffins (recipe by Super Healthy Kids).